Fiction – hardcover; Michael Joseph; 384 pages; 2010. Review copy courtesy of the publisher. When it comes to books, everyone has their guilty pleasure — and mine is Nicci French*. Her novels are not exactly highbrow literature, but each one delivers an entertaining and thrilling read, with plenty of twists and turns in the plot to keep you guessing right until the final page. I’ve read each of her 11 novels (although you’ll only find six reviewed on this site), and Complicit, her 12th (published last week), was eagerly anticipated by Yours Truly. I saved it for my four-day Easter break and raced through it in a matter of a day, because, as cliched as this sounds, I could not bear to put it down! The story begins with our narrator, Bonnie Graham, visiting her boyfriend’s flat only to find the body of a man laying face down, arms splayed, with a dark stain of blood spreading from under his head. Quite clearly he is dead. But instead of calling the police and doing what you would normally expect someone to do when caught up in such terrible circumstances, Bonnie calls her best friend, Sonia, to help her dispose of the body. But who is the victim? And did Bonnie murder him? If so, why did she commit the crime? And will Sonia help, or go to the police herself? The psychological tension is strengthened by the method in which the story is told. There are no chapters in the book, but the narrative is broken into two threads — before and after the murder — which are chopped up into bite-sized chunks and interleaved. This allows you to contrast the events leading up to the murder with those that occur long after the body has been dumped. It’s difficult to flesh out the storyline without giving away crucial plot spoilers, but I can tell you that it’s set in London over a six-week period. Bonnie, who is a music teacher, has agreed (against her better judgement) to put together a band to perform at a friend’s wedding in September. She assembles a motley crew of musicians, young and old alike, none of whom get on particularly well. This creates its own set of tensions as petty jealousies and old rivalries come to the fore. The more you read, the more you begin to realise that any one of these characters could be the murderer — or the victim. But, as ever with a Nicci French book, all is not as it seems. Just when you think you’ve got a handle on the story and know where it is most likely headed, a new bit of information comes to light that turns everything upside down. I’d got about half-way through the book, convinced that I knew the outcome, only to find I was utterly wrong when I did, at last, reach the end. Is it plausible? Probably not. But who cares? This is a deliciously fun and genuinely thrilling read. I just wish I didn’t have to wait another 12 months for the next one! UPDATE: This novel is being published in the US under the title The Other Side of the Door. * Nicci French is a pseudonym for the husband-and-wife writing team of Nicci Gerrard and Sean French. These sound like the perfect guilty pleasure. I like how the husband and wife team came up with the pseudonym, too. Cb james, they are definitely my favourite guilty pleasure. I’ve been reading these guys for more than 10 years and they are never disappointing! 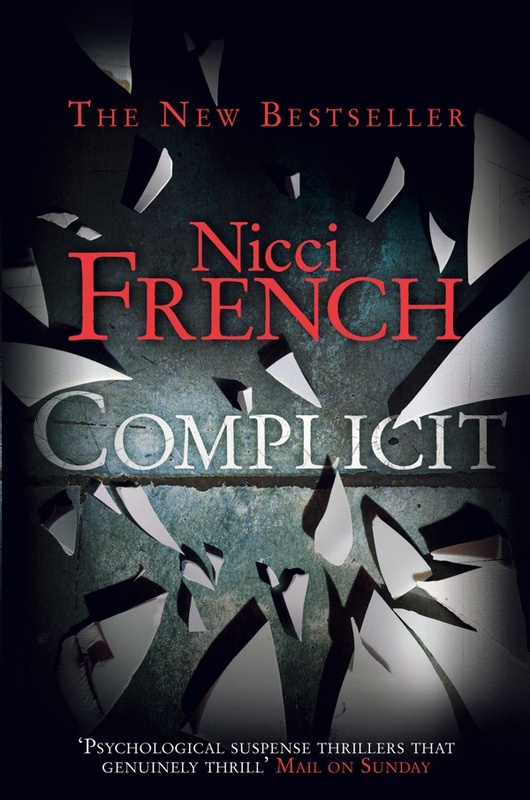 I’ve never read Nicci French, but your review makes Complicit sound enticing. I think I’m going to give it a try. It’s a fairly quick easy read, Violet. But that applies to all the French books. This one, however, is far less gruesome than some of her earlier work. Oh we do love a guilty pleasure. Mine is Tess Gerritsen I simply cannot put her books down which is why I am getting through them so slowly as the idea of waiting a year to read another is torture. This sounds like a great crimey escape and what more could you want on a nice long break? Didn’t know it was two of them writing this… how on earth does that work I wonder? I also like Nicci French…although I haven’t liked any of her books as much as I liked the first one I read, Killing Me Softly. Have you read any of Nicci Gerrard on her own? She’s very good. No, I’ve never read any Nicci Gerrard. Can you recommend any particular title as being a good place to start?